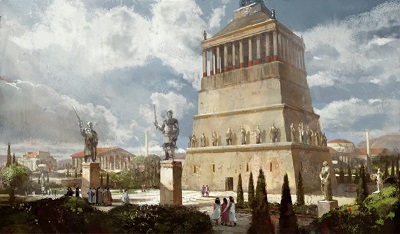 Mausoleum at Halicarnassus - One of the Seven Ancient Wonders of the World. It was built in Caria on the west coast of Asia Minor between 353-350 B.C. and was the tomb of King Mausolus (from which the name mausoleum comes) and his queen, Artemesia, who was both his wife and his sister. The building stood 148 feet high (45m) and borrowed from local as well as Greek and Egyptian architecture. Construction began after Mausolus died and was completed the same year as Artemesia's death. The two were cremated and their ashes mingled.